Traditional Greek dish prepared on fire in special clay cookware! 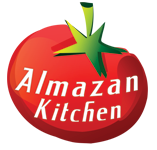 With homemade organic ingredients and a notch of AlmazanKitchen attitude! Slice 1 aubergine in circles. Salt it. Fry 500g of beef mince with grated cinnamon, pepper and salt. Cook until brown texture. Chop few spring onions and add into the pan. Add 1 cup of homemade tomato juice. Slow cook for 30-40 min. Take the clayware pot. Place aubergine circles in the bottom. Grate and add 50g of parmesan. Egg goes to the pan with mince. Mix it then transfer to the clay pot. 50g of parmesan more. Make another layer of aubergine. Finish off with another 50g of parmesan. Preheat the pan. Melt 2 tbsp. of butter. Add 1 tbsp. of flour. Stir and mix well. Add ½ cup of milk and salt, mix well. Grate some nutmeg. Mix again, cook for few minutes and then transfer the sauce to the pot. Easter is afew days away and i will use lamb mince. I have an outdoor oven and impiments similar to those used in the video.